What has Star Trek fandom–and ficcing specifically mean to me? Well, the Star Trek fandom has always been special to me. Ficcing especially for TNG has been a source of enjoyment for me since the early 2000’s. I’ve enjoyed getting to know all the TNG characters, watching episodes to get ideas for my fanfics. But I especially like writing Riker. Ficcing gives me an outlet in which I can express myself. I hope that I can continue to express myself with the different stories to come. 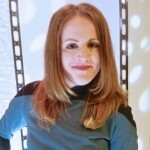 Week 7 Blog Like A Boss Prompt #3: Who’s your favorite Trek blogger and why? Previous Post0 post for Blog Like A Boss Week 7: Prompt: The Little ThingsNext PostWeek 7 Blog Like A Boss Prompt #2: What is the hardest story you ever had to write? What was the easiest? And why? Very concise response. I’ve only seen snippets of your Riker-Troi stories, but the premise of your AU is rather intriguing. I’ll definitely be looking forward to your future stories. Cheers for the truthful answer.